Ronald Says - memoirs of a music addict: Are Frankie & The Heartstrings The Best Next Thing? Are Frankie & The Heartstrings The Best Next Thing? They are THE sensation in the UK at the moment and are said to be the front runners of the next britpop resurrection according to the British press. And all this as a result of their energetic performances because so far the quintet from Sunderland only released an EP. That's about to change with this debut album that according to the band found its inspiration in the 1890 novel of a certain Knut Hamsen. 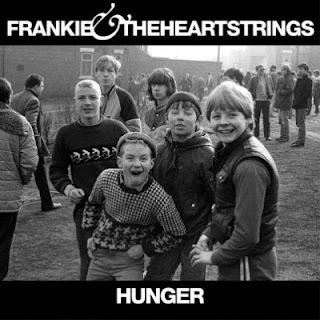 With 'Frankie & The Heartstrings' as a band name and the album cover for 'Hunger' in mind you would think it's a fifties revival instead of a new britpop band. And you may be startled when hearing the opening track that starts with a capella harmonies. But then the jumpy guitar riffs kick in and you're treated to cheery songs like Blur and more recently Franz Ferdinand can come up with. Catchy guitar lines and hooks are thrown in generously and all of this is topped off with tasty rock 'n' roll. In just over half an hour 10 tracks pass by that for the most part are short catchy songs in fifties style including the characteristic backing vocals. The record breathes the atmosphere of that era but really doesn't sound old-fashioned or outdated. Especially the up tempo songs are heavy on rock 'n' roll but a slow ballad like 'Fragile' sounds quite modern and it doesn't get more British than 'It's Obvious'. Despite this apparent diversity the songs sound alike a lot and there isn't too much in them really. Simplicity can be a strong asset but you get the idea that the amount of attention may be a bit exaggerated. It's mainly easy to enjoy music that's best digested in a lazy chair with a nice cold beer on a hot summer night. Frankie & The Heartstrings deliver a cheerful album that will probably do well because of all this attention and promotion. De summery tunes will appeal to many on the festivals for sure and maybe they manage to conquer the European mainland as well. But I don't think the hype is completely justified and could be short lived. Or their live performances truly are of epic proportions. If they can live up to the big expectations and really are the front runners of a next britpop generation is questionable. Unlike the front runners of earlier generations the band still misses the necessary significance. This review has been published on ROARezine in Dutch over here.